On Saturday, Mark Steyn posted an article at National Review Online talking about the relationship between the bankruptcy of Greece and President Obama’s healthcare proposal. Mr. Steyn points out that both events are part of the same story–the events just represent different phases of the story. The bottom line here is that any government gets more of what they subsidize. If the government keeps extending unemployment benefits, unemployed people will be in less of a rush to find a job when they lose one. If being married means that you pay more in income taxes, fewer people get married. When it doesn’t pay to be responsible, fewer people become responsible. When states have reason to believe that if they legislate themselves into financial failure, the federal government will bail them out, they have no incentive to cut costs. As the Democrat party continues its push to pass an extremely expensive healthcare reform bill, it potentially puts America further down the road of financial irresponsibility. We still have the choice of whether we continue on the path that Greece is on or if we turn around while we can still prevent financial disaster. On January 20th, Palestinian Mahmoud al-Mabhouh was found dead in a hotel room in Dubai hotel. On February 20th, Reuters reported that the police chief in Dubai suspected that al-Mabhouh had been murdered by Israel’s Mossad. Mahmoud al-Mabhouh was a Hamas commander. On February 27th, the UK Times reported that Mossad was seeing an increase in applications from Israelis interested in joining the agency. OK. Israel is being blamed for a very sloppy killing (very unlike Mossad), the world condemns it, and Israelis try to join Mossad. But that’s not where the story ends. Scott Johnson at Power Line posted a story yesterday which further complicates the issue. Although the authorities in Dubai are saying that Mossad murdered al-Mabhouh, the only people arrested for the crime so far are two Palestinian Arabs. The New York Times reported on February 24th that two of the suspects in the murder named by the Dubai police have fled Dubai for Iran. The bottom line here is that this story makes absolutely no sense at all. The murder was very sloppy for Mossad, the two suspects who were arrested were Palestinian Arabs, and two of the suspects have fled to Iran. Somehow I don’t think that if I were an Israeli member of Mossad, Iran would be on my list of places to flee. I am awaiting further developments in this story before I draw any conclusions as to who did what! Yesterday’s Providence Journal posted the latest information on the ongoing battle to save Central Falls High School. Jane Sessums, president of the Central Falls Teachers’ Union, has stated that the teachers will appeal to the school district’s board of trustees. She is planning to meet with union leaders and labor representatives before deciding to take additional legal action. The Superintendent of the school, Frances Gallo, said that initially she hoped that teachers would agree to a series of changes that would help the school improve academically. These changes included additional training for the teachers, a longer school day, requiring teachers to offer more tutoring, and requiring teachers to eat lunch with the students once a week. When the teachers union said that they would not agree to these changes without receiving additional pay, the school district offered to pay the teachers for the additional training they would receive over the summer, but not for the longer day or eating lunch with the students once a week. When the negotiations broke down, Ms. Gallo made the decision to fire all the teachers, with the understanding that many of them would be rehired. I really believe that this is a case of a union getting in the way of something good being accomplished. The school district offered to pay for the additional training in the summer. I think that was appropriate. With that concession, I don’t understand why the teachers didn’t agree to the suggested changes. Although it would be my worst nightmare, it seems to me that a dedicated teacher might enjoy lunch with his or her students once a week. (I might even enjoy it if the cafeteria food was good!) I also wonder how long the day was going to be extended. I realize that teachers put in a lot of time after school, but I wonder if a little flexibility on the part of the teachers would have made a big difference here. Again, I wonder if the union got in the way of progress. Hopefully this will be resolved in a way that is best for the students at the High School. I wonder, though, if it is time to reevaluate the role of unions in the public sector. Thursday’s Washington Examiner posted an op-ed piece by Charmaine Yoest, president and CEO of Americans United For Life. Ms. Yoest points out that the issue of issue of federal funding for abortion was not mentioned Thursday at the healthcare summit until House Minority Leader John Boehner brought it up mid-afternoon. At that point, President Obama did not directly address the issue, and it was not addressed until almost the end of the session. Nancy Pelosi stated that there was no public funding of abortion in the current bill. Seventy-two percent of Americans oppose federal funding of abortion. The healthcare bill currently under consideration requires private health insurance plans to cover abortions, and it allows federally-subsidized plans to cover abortions. The latter is a change in the law. The bill imposes an abortion tax on people who use the health exchange. The current healthcare bill also fails to protect the conscience rights of people in the healthcare profession who do not want to participate in abortions. This could be a real problem for Catholic hospitals. Even if this money is not used directly to fund abortions, if this money is used for administrative costs, it will free up more money within the organization to fund abortions. It really is time to start from scratch on the healthcare reform bill. John Hinderaker at Power Line posted an article yesterday about a Democrat party attempt to tie the hands of our intelligence professionals. Fortunately, someone read the bill they were voting on and this provision was not passed. “That Democrats would try to bury this provision deep in the bill, late at night, when they thought everyone’s attention would be focused on the health care summit is a testament to the shameful nature of what they were attempting. It is unfortunate that defending our country has become so political. It’s beginning to feel like a very long (and not particularly well played) chess game. Kim Strassel at the Wall Street Journal posted an article about Thursday’s healthcare summit. The summit was designed to showcase President Obama’s skill at finding common ground and solving problems. Unfortunately, someone forgot to mention that the President has not previously exhibited these skills and there was no reason to believe that he has them. The conventional wisdom is that President Obama will make some sort of speech on Wednesday or Thursday followed by a push by Congress to pass the bill through the reconciliation process. There are a few risks involved in this. The Senate Parliamentarian is in charge of ruling what parts of a bill are eligible for the reconciliation process, but he can be overruled by the President of the Senate (the Vice-President, Joe Biden). In the Senate, total debate on a reconciliation bill is limited to 20 hours; however, after that 20 hours has passed, motions and amendments can be offered and considered without debate. This could be a procedural nightmare if the Republicans decide to block the bill by offering endless amendments. Another risk of using the reconciliation process is the possible backlash of public opinion. Although many Americans believe healthcare reform is a good idea (myself included), polls indicate that most of us do not want the government taking over our healthcare system. This is an election year–all of the House of Representatives is up for election in November and one-third of the Senate. It is unusual historically to have major legislation passed in an election year, even if it is a mid-term election. There is also the question of whether or not there are enough votes in the House of Representative to pass the healthcare bill if it is passed in the Senate through the reconciliation process. The public funding of abortion issue would have to be dealt with, and some of the exceptions made in various provisions for certain states might become an issue. If Medicare Advantage is not a good program, why are senior citizens in Florida allowed to continue their participation in the program while senior citizens in the rest of the country would not be allowed to access it? Ben Smith at Politico posted an article yesterday about the Democrat party’s plans to use conservative talk radio to get thier message out. This should be interesting. The Democrat group Organizing for America has put up a cite which guides people who are not conservative through the process of talking to conservative talk show hosts. The cite is radio.barackobama.com. This plan will give millions of Americans new choices in health insurance by making coverage more affordable, ending the denial of coverage for pre-existing conditions, putting power in the hands of consumers instead of insurance companies and providing one of the largest tax cuts in history while also reducing our national deficit. That is totally untrue, and hopefully the conservatives listening are well enough informed to know that. The plan will put power in the hands of the government. The plan raises taxes for four years before providing any benefits–that is how they got the Congressional Budget Office estimate of the cost of the plan to be relatively low. Too many in Washington are now saying that we should delay or give up on reform entirely, but Americans understand the stakes for our economy and our lives, and we want action. Healthcare reform is not directly related to the economy–other than the fact that the government wants to take it over. Action that causes more harm than good is not useful action. The website also encourages people to be polite and share a personal story about how healthcare costs affect them. How about actually relating what is in the bill? Today we were sent your story of February 14, 2010. The “unknown” Canadian is our son Danny. He is a 23-year-old soldier from Vancouver, Canada. Danny’s injuries were the result of an explosion on February 12, 2010. Four Canadian soldiers were injured and tragically one Canadian soldier was killed. Within 20 minutes of the explosion, Danny was airlifted by helicopter to Kandahar. 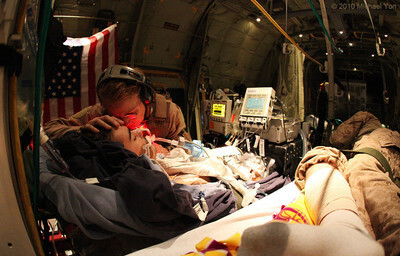 Upon arrival he received emergency surgery that saved his life and prepared him for the flight to Bagram that you were on. This was Danny’s second tour of duty in Afghanistan and his platoon on this tour has had heavy causalities and injuries. Physically, Danny will overcome his injuries. He also has the support of his family, his friends and his community to deal with the emotional side of this war. Our hearts go out to those families who have had the loss of a soldier or who have had to deal with greater injuries. Danny and his whole family are very grateful, and are actually overwhelmed, by the support he received while in US care. The Canadian military have also been wonderful. It is our intention to personally thank everyone who worked so hard to save Danny’s life. We have already made contact with Major Deborah “Lucy” Lehker to thank her. Thank you, Danny, for your service. Thank you, Jim and Holly, for taking the time to say thank you and remind us that even though the cost of war is high, cooperation between countries saves lives. Best wished to Danny in his recovery. I have spent the morning watching the bipartisan healthcare summit. I seems to me that the Democrats are trying to say that there is agreement on the majority of healthcare issues their bill will solve, so the Republicans should pass the Democrat bill. There may be agreement on the problems, but there is absolutely no agreement on the solutions. That is becoming very obvious. There were a lot of lies in what I heard. As Harry Reid said that the Democrats had no intention of using the reconcilliation process, Politico reported on the Democrat strategy to pass this bill. This does not sound as if the meeting is being held in good faith. There is also reporting on the meeting by Real Clear Politics. This is the link at Real Clear Politics to the President explaining that the reason that the Democrats have more speaking time at the healthcare reform summit–“I don’t count my time because I’m the President.” This is the link at Real Clear Politics to Speaker of the House Nancy Pelosi saying “Health reform will create 400,000 jobs ‘almost immediately. '” Somehow I expect those jobs will be union jobs in the government. The general problem with this healthcare summit for the Democrats is that the Republicans are quoting parts of the approximately 2,200 page bill back to the Democrats who are not happy about having to defend their bill. I know the stated purpose of this meeting was to bring to people together. In practice, it is only highlighting the differences between the Republican and Democrat ideas on healthcare reform. Generally speaking, the Democrat party wants healthcare taken over by the government and the Republicans want the free market to be used to correct some of the more serious problems. The Republicans are looking for small practical steps to solve rising healthcare insurance costs, and the Democrats are looking for a government takeover of the entire healthcare industry. Frankly, the videotapes of this meeting could be marketed as a cure for insomnia. Needless to say, there is a lot of chatter on the internet about the death of Sea World animal trainer Dawn Brancheau. Mcclatchydc.com reports today that Tilikum, the 23-foot, 6-ton male orca that was responsible for Ms. Brancheau’s death, had been involved in the death of two other people since 1991. The San Francisco Chronicle yesterday posted a story that pointed out that there are no documented cases of a killer whale attacking a person in the wild. The author of the article wonders if there is something in the captivity of the whales that causes the occasional aggressive behavior toward their trainers. “To put it plainly, the corporate exhibiting of killer whales today in show parks is for pure and simple profit. Any “research” claimed by these overpriced popcorn and hotdog purveyors has barely more credibility than the so-called “research” conducted by the Japanese whale-killing ships in the Antarctic. That may be the best idea on the subject I have heard. I will admit I have enjoyed the shows at Sea World, but it may be time, out of respect for the creatures involved, to let those shows end. There are some animals who enjoy performing for their trainers (dogs, I believe, fit in that category), but the killer whale is a very large wild animal that may not adapt well to captivity. Today’s Washington Examiner posted a story about the obvious conflict of interest involved in the government hearings on the Toyota acceleration issue. First of all, there is the obvious problem that the government holding the hearings has a controlling financial interest in General Motors–Toyota is one of General Motors’ biggest competitors. The other problem is that one of the largest contributors to the Democrat party (currently in control of Congress, thus holding the hearings) is the United Auto Workers Union. Toyota has successfully avoided being unionized at its manufacturing plants in America. The article points out that 19 of the 36 Democrats on the committee investigating Toyota received large contributions from the UAW for their 2010 campaigns. That includes the chairman of the committee, Henry Waxman. The obvious conflict of interest makes it nearly impossible to come to an objective and practical plan of action to prevent future safety issues in any auto company. There is another problem with the hearings. The two ‘expert’ witnesses that Congress has called have a history with American automobile manufacturing. Joan Claybrook was the head of the National Highway Traffic Safety Administration under Jimmy Carter. She was responsible for forcing car makers to install air bags. She pushed the requirement through despite warnings that the technology needed further development in order to avoid killing infants and children. Because of her actions, at least 65 deaths resulted, including infants and children. The other expert is Clarence Ditlow, executive director of the Center for Auto Safety, who condoned the use of rocket ignitors in the NBC report that stated that GM pickup trucks were dangerous. Both these people have histories in the auto industry that are questionable at best, and their testimonies should be viewed with skepticism. Boston.com reported today that former Patriots fullback Mosi Tatupu has died at the age of 54. Mr. Tatupu was an asset to the communities around Foxboro during his playing years with the Patriots and after he retired–he participated in numerous charitable events and later became the coach of the King Philip High School football team in Wrentham, Massachusetts. His son, Lofa, is a Pro Bowl linebacker for the Seattle Seahawks. I am sure the sports reporters will list all of his accomplishments as a player for the New England Patriots (and there were many), but those of us who live in the area will remember him more for the things he gave to the community. Mosi Tatupu will be fondly remembered and greatly missed. Tuesday’s Washington Times posted an article pointing out that newly-elected Massachusetts Senator Scott Brown was one of five Republicans who voted for the jobs bill and avoided a filibuster. The bill comes up for a final vote today. Good Grief! The man has voted twice in the Senate that I am aware of. One vote I agreed with and one vote I have mixed emotions about, but let’s give the man some space! I voted for Scott Brown because I felt he would vote according to his conscience. He is proabably not as conservative politically as I am, but he was elected in Massachusetts to fill a seat held by Ted Kennedy since the 1960’s. Give the man a break. Because the meeting of the bipartisan minds on healthcare reform is scheduled for Thursday, there are a lot of comments and articles up on the internet dealing with healthcare reform. Here are some excepts from a few. The Hill posted an article Monday pointing out that the healthcare reform bill proposed by President Obama is partially paid for by rescinding the “black liquor” tax break abused by paper companies that claim undeserved alternative fuel tax credits. The jobs bill proposed by Senate Finance Chairman Max Baucus (D-Mont.) and ranking member Chuck Grassley (R-Iowa) bill also rescinds this tax break. This sounds more like a tax bill than a healthcare reform bill. “After months of swearing that his health legislation would lower the skyrocketing costs of insurance premiums, Obama finally acknowledged that actually it would not. The New York Post points out that if the Obama healthcare reform proposal would actually lower health insurance premiums, there would be no need to pass a law outlawing premium increases. Those of us who were around in the 1970’s remember what wage and price controls do. This is essentially the same thing. When you limit the profits of a company, they tend to do less of what they were doing. To limit the right of insurance companies to raise their rates will ultimately limit the amount of healthcare available to all of us. The only way to move forward with a healthcare plan is to scrap everything proposed so far and start over. I posted and article yesterday on the small bill (rightwinggranny.com). There is a way to successfully do healthcare reform in only one page. It’s time to consider that proposal. The news on the unraveling of man-made climate change theory is not being widely reported in the American press, but the British press has stayed on the story. The guardian.co.uk reported Sunday that scientists have been forced to withdraw the numbers previously published on rising sea levels. A study published in 2009 in Nature Geoscience predicted that sea level would rise by between 7cm and 82cm by the end of the century. The study was supposedly based on data from the past 22,000 years. The Intergovernmental Panel On Climate Change (IPCC) had released a study in 2007 stating that the sea level would probably rise18cm-59cm by 2100. These statements have now been retracted. “In a statement the authors of the paper said: “Since publication of our paper we have become aware of two mistakes which impact the detailed estimation of future sea level rise. This means that we can no longer draw firm conclusions regarding 21st century sea level rise from this study without further work. In a world where the weatherman may not even get his predictions for next week right, I think we need to be careful how seriously we regard his projections for the next century. An alternative healthcare reform bill is posted on the internet at smallbill.org. The bill is, literally one page long. The small bill increases spending by $180 billion, Obamacare increases spending by $2.5 trillion. There are no tax increases in the small bill. Obamacare increases taxes by $1.0 trillion. There are no Medicare cuts in the small bill. Obamacare cuts Medicare $800 billion (according to CBO projections for the Senate bill from 2014 to 2023). Obamacare insures 260,000 new people for every $20 billion spent. The small bill insures 1.1 million people for every $20 billion spent. Unless doctors’ pay under Medicare is cut by 21%, Obamacare results in $217 billion in deficit spending. The details of how this is done are listed on the small bill website listed above. Remember, it only took eighteen pages to found our nation. We should be able to do healthcare reform in less pages than that! More information on the small bill can be found at the Weekly Standard.. There are two sources for this article, one in today’s Washington Examiner, and one in today’s Washington Times. The current conventional wisdom says that President Obama will use the reconcilliation process to pass a totally Democrat healthcare reform bill. The Republicans are being invited to a very public meeting on Thursday to provide cover for this effort. Passing healthcare reform with less than sixty votes by using parliamentary trickery is not likely to impress the American voters. It will probably cost many Democrats who vote for the plan their seats in November. Hopefully, because the cameras will be rolling, Republican ideas will also have a seat at the table. Will Russia Deliver The S-300 Anti-Missile System To Iran? Today’s Jerusalem Post posted an article about the delivery of Russian S-300 anti-missile system to Iran. Evidently, Russia promised the system in its bid to gain more influence in the Middle East, but seems to be waffling on if or when it will actually deliver the system. There are a few things to consider here. First of all, Russia has never been known to be a team player on any team. Russia will do whatever it needs to in order to get whatever it wants. It is not a country known to be overly cooperative with any other country. Second of all, if this system is delivered, it will make an Israeli strike on Iran’s nuclear facility much more complicated–not impossible–just more complicated. The third thing to consider is the state of anti-government feelings in Iran. The rather perverse government of Iran may be attempting to instigate an attack against Iran in an effort to unite the people of Iran against a common enemy and end the current unrest. Unfortunately, there are no good options in dealing with an Iran about to become a nuclear power. The only hope of avoiding that is another Iranian revolution. There are two recent articles posted on the internet commenting on the latest Democrat party talking point–“the United States in ungovernable.” One is at Power Line, written by John Hinderaker, and one is at the Washington Post, written by Charles Krauthammer. Both articles remind us that this is the common cry of a party trying to pass unpopular laws. One of the joys of the new media is that it puts the facts at everyone’s fingertips and allows all of us to evaluate statements like ‘the government is broken’ in the context of history. Charles Krauthammer points out that the government seems to be broken only at times when we have Presidents who don’t seem to be able to accomplish anything. It magically gets fixed when a different President is elected. Today’s UK Times Online posted a story about the war our soldiers in Afghanistan are fighting against the improvised explosive device (IED), the Taliban’s weapon on choice. The IED has been around for a while. It was used by Guy Fawkes to try to blow up the British Parliament. Lawrence of Arabia used them, the Viet Cong used them, and the IRA used them. The term IED was coined by the British Army to describe the bombs the IRA was making. Aberdeen proving ground in Maryland is developing a robot that will enable American soldiers to disarm roadside IED’s without putting themselves in danger. The robots cost $150,000 each. One soldier working with the robots, Sergeant John Stricklett, lost three robots on his last deployment to Iraq. He comments in the article that if he had been walking down the street to disarm the IED’s involved, he would have been lost. The real answer to finding and disarming IED’s is having alert soldiers who pay attention to details in their surroundings. I remember reading in an article from an embedded reporter that he had learned not to go on patrol with any group of soldiers driving a vehicle with a dirty windshield–if the windshield was dirty, it was easy not to spot the tripwires that often triggered the IED’s. Today’s Washington Examiner posted an article about various municipal counties encouraging illegal aliens to participate in the 2010 census. Why is that important? The article points out that each illegal alien is worth about $1,000 in federal funding. According to the Department of Homeland Security, there are an estimated 10.8 million illegal immigrants in the United States at this time, down from 11.6 million in 2008. At $1,000 each, that is $10.8 billion going to support illegal aliens. Meanwhile, there is talk about cutting Social Security, which Americans under the age of 80 have paid into all their lives. This is just wrong. Why are we funding something that is illegal? Illegal immigrants are not paying taxes, social secuiry, or legally participating in the American workplace. We need to make our immigration laws more reasonable so that the people who are here illegally that are hard working and want to contribute to our economy can be here legally and those who are simply taking federal handouts can be sent home. According to today’s Washington Times, Afghan President Hamid Karzai has asked NATO to do more to protect civilians as their troops take Marjah from the Taliban. I understand the need to protect innocent people, but how do you do that when the Taliban is using the residents of the area as human shields? “Once the town is secure, NATO plans to rush in a civilian Afghan administration, restore public services and pour in aid to try to win the loyalty of the population and prevent the Taliban from returning. Again, I understand the need to protect innocent civilians, but not at the expense of losing NATO soldiers or the expense of losing the war. What we need are some really good snipers. If the Taliban soldiers know that they will be safe as long as they hide with civilians, I am not sure victory is possible. The problem is not our disregard for civilians, it is the Taliban’s use of civilians as human shields. “Faleh Almaleki is charged with first-degree murder, aggravated assault and two counts of leaving the scene of a serious accident. Mr. Almaleki will not face the death penalty. When a person immigrates to this country, he is free to practice his religion, but when some aspect of that religion (murder or honor killing) violates United States law, he should be prosecuted to the fullest extent of the law. Honor killings are happening with increasing frequency across this nation, and the American court system needs to send a loud and clear message that this is unacceptable. Yesterday’s Providence Journal (Providence, Rhode Island) carried the story on the ongoing battle between Frances Gallo, the Superintendent of the Central Falls school district, and the teachers’ union over how to fix the failing Central Falls High School. “Gallo said she offered the high school’s 74 teachers “100-percent job security” for the 2010-11 school year, if they’d agree to her six conditions to transform the low-performing school. I have no idea who is telling the truth, but shouldn’t the emphasis be on making sure that the children in that school get the best education possible? Ms. Gallo, in response to the lack of agreement with the teachers’ union, has sent letters to every teacher at the High School terminating them at the end of the year. The school district’s Board of Trustees will vote on Gallo’s recommendation Feb. 23. It sounds to me as if Ms. Gallo’s options are somewhat limited and that she is in compliance with the law. I have no idea why the school is failing, but as someone who gradulated from public school in the 1960’s. I feel that a large portion of our educational system is not giving the students the basic survival skills they need to be successful when they graduate. I know that family situations are very different today than they were in the 1960’s and that might be part of the problem, but we need to find out why some schools are successful and some are not. The Seaford Star, a Delaware newspaper, posted a story about the farmers in Delaware who took it upon themselves to plow the roads after the snowstorms last week. Many of the farmers of the state began plowing state roads after the snowstorms before being asked. Why am I posting this story about Delaware farmers? The thing that has always made America a great country was the private sector. People who saw a need and filled it, helping their neighbors and earning a profit in the process. This story is an example of that quality. Delaware is not used to dealing with the amount of snow they have recently seen. They are not equipped to handle it, nor would it be productive for the state to be prepared for major snowstorms when they are not a common occurrence. Thank you, Delaware farmers, for your initiative and willingness to help your fellow citizens.